My time in Alexandria ended with having dinner with some very good friends from Baltimore. Bonnie and Peter are friends from my Cleveland Institute of Music days. Both were roommates of mine at the infamous 1961 Ford apartment, a block up from CIM. I lived in a huge old five-bedroom apartment for two and a half years with many roommates, (Bonnie’s room was directly opposite mine) during which we watched Saturday Night Live every week, I rode my bike around the apartment (it was that big!) 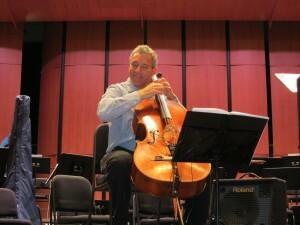 and even sometimes practiced my cello. Peter and Bonnie got together during that time and have been a couple ever since. At some point, long ago, they contacted me and have been coming to Turtle Island concerts and hanging out, supporting me as a cellist and friend, and just generally being wonderful friends. Joining us was cellist and long time friend, Cindy Rosenberg. I met Cindy at the first Stanford Jazz Workshop Turtle Island taught at, sometime in the early 1990’s. Cindy has driven me all around the Washington DC area, made sure I had good food to eat when I’m here, and has been a good friend. We all talked about crazy musicians we knew, and about the good old days of living in a big apartment together. I was able to share some very old photographs taken by another cello friend, David Rosen, who plays in the New Orleans Symphony. Bonnie had a good laugh at seeing picture of both of our younger selves, without all the grey hair. Seeing the photos again gave me the perspective that my CIM days weren’t all bad, and provided the proof of how far I have come in my quest to heal from my baggage of a classical music education. I hope I have truly recovered from classical music!